The new ‘Christmas’ edition of Scala Playhouse’s PLAY magazine, filled with gift season suggestions, is out now. 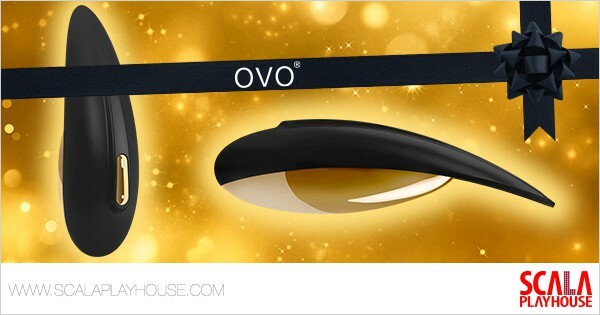 With a black and gold lay-out, it has a similar design as the OVO S1 Lay On – one of the products, which Scala Playhouse is promoting for the upcoming holiday season. OVO – the German brand in modern and contemporary adult novelties – produces modern pleasure providers with a non-intimidating look and feel. One of the highlights from the OVO assortment at Scala Playhouse is the OVO S1 Lay On in black and gold. This sleek, USB-rechargeable stimulator offers versatile intimate fun, is made of premium silicone and has vibration settings. “With its luxurious black and gold color scheme, it is a beautiful gift for your loved one this Christmas,” the company said.